Please welcome author Patti Sherry-Crews to my blog today. I had the pleasure of working with Patti on the recently released A CHRISTMAS COWBOY TO KEEP. Her wonderfully romantic contribution, COUNTING DOWN TO CHRISTMAS, features cookie-making. Read more about Patti's inspiration for the story. I remember when I was a young mother how excited I was to carry forward all the holiday traditions I’d grown up with. Baking cookies and other treats at Christmas being one of them. And I’d been given all my grandmother’s and mother’s bakeware! I have quite a collection. I baked and baked and baked, going through more pounds of butter in a month’s time than I did the preceding eleven months of the year. Sadly, I quickly learned nobody was going to eat all those cookies and cakes except for me— valiantly devouring sweets the best I could. Those pounds of butter looked attractive on my derriere. I stopped baking almost entirely, and that decreased with children moving out, combined with new requests for gluten-free, no-carb, vegan, low-sugar, and dairy free foodstuffs. But I still have all these wonderful cookie cutters and tins, and even though I didn’t use them to bake anymore, they still are a presence. Just seeing them brings so many memories and people back to me. So every year they come out. I string the cookie cutters along garlands, make chandelier type arrangements out of evergreen wreaths and dangle the cookie cutters off of them. I make little tableaus of my gingerbread house mold and my Rudolph the Red-nosed Reindeer jelly mold. I get as much pleasure out of thinking of new ways to display my collection as I do seeing them. When I wrote my story, Counting Down to Christmas in the set A Christmas Cowboy to Keep, I knew there had to be a cookie decorating scene. And knowing how much these family keepsakes mean to me, I spent time on sites like Pinterest and Etsy trying to track down my own cookie cutters and bakeware, sometimes even finding images of some in their original packaging. What I found out was that I have a collection spanning back through decades of family history starting with my own additions like my Ugly Christmas Sweater and gigantic snowflake cookie cutters. 1950’s: The aluminum one-piece angels, etc., the melamine marbleized camel and elephant and other circus characters in salmon pink, and the red transparent gingerbread men. 1930’s: All the cookie cutters with mint green or red painted wooden handles. It turns out my Rudolph jello mold was actually once part of an 8-piece cake set from 1939. Robert May, the man who wrote the song Rudolph the Red-Nosed Reindeer, held the copy-write for the set. Incidentally, he lived in my town, and I went to school with his daughter. The 8 Piece Cake Set. I Found my “Jello” Mold! Another odd piece I’m fond of displaying is my gingerbread house mold. It’s not a kit like you see nowadays where you piece together flat sections of gingerbread with frosting. My mold makes a solid gingerbread cake. It came out in the year I was born, 1958. 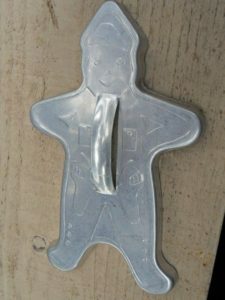 And even though I don’t own this cowboy cookie cutter it has a special place in my story. Read the excerpt below to see how this guy brings out the Christmas spirit in a Christmas Grinch. Leland looked at the racks of cooling cookies set out over the table, along with bowls of colored icing and decorative sprinkles. The women were already at work spreading icing on the cookies and setting them on waxed paper. He grabbed one off the rack nearest to him and sat down. Melody wrinkled her nose with distaste. He ignored her and picked through the old hat box full of cookie cutters. He pulled out one and his heart leaped with joy. “Mustang Muldoon!” He cried out before he thought about it. The delight in his voice took Melody by surprise. Her hand stilled in the middle of reaching for another cookie to decorate. She looked up at Leland and witnessed a transformation in his face. He held an ancient-looking cookie cutter. His eyes were crinkled and sparkling, a contagious grin spread across his face. “What is that?” she couldn’t help but ask, pointing to the vaguely humanoid shape in his hand. “The cookies do lose some detail when you bake them,” said Alma. “We used chocolate jimmies. I think I have some in the pantry.” Alma got up from the table. Melody studied Leland as he hunched over to spread white frosting on his cookie. His hair had flopped over his forehead and he was biting his bottom lip in concentration. She could see the small boy in him, and a sudden warmth washed over her heart, which she quickly dismissed. Patti Sherry-Crews lives in Evanston, Illinois, with her husband, one bad dog, and one good cat. She is a mother of three grown children and about to become a grandmother for the third time this winter. She is an award-winning author who writes contemporary romance and women’s fiction as well as historical western and medieval romances. wow that is quite an awesome collection – we too have many off these in the copper and aluminum!! Love cookie day!! The Grands love the decorating part and so far have only done the colored sugars (they get everywhere) and am thinking of frosting some this year! Hi Teresa, I’m so glad you stopped by! You know, you can have things for all your life but when you look at them with a fresh eye, they have new stories to tell. It’s fun you have some of the some pieces. I have a real weakness for frosted cookies…so much I don’t dare have them in the house.Thanks again for stopping by and have a joyous holiday season! Loved the post! The cookie cutters reminds me of baking cookies with my grandmother. So interesting to learn the history behind the cookie cutters and how you incorporated your personal experience with the cookie cutters into your novel! Wonderful ? Hi, Jill! Thanks for stopping by! the cookie cutters do have a history! And now with the internet it’s so easy to find your family heirlooms. Not only do I draw on memories for the story sake, I like to think of it as scrap booking my experiences.